Deputy Sheriff Michael Keane doesn’t particularly enjoy being touted as the hero of Hidden Springs after pulling a suicidal man back from the edge of the Eagle River bridge in front of dozens of witnesses–a few of whom caught the breathtaking moments with their cameras. But the media hype doesn’t last long as a new story pushes its way into the public consciousness of Hidden Springs’ concerned citizens. 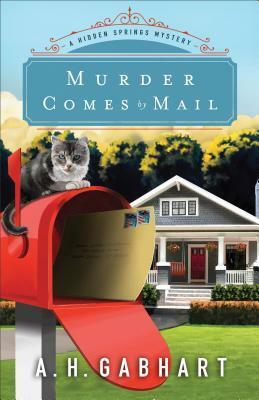 Murder Comes by Mail is sure to delight cozy mystery fans! Gabhart weaves an intriguing suspense while capturing the essence of small town living and bringing to life a cast of colorful characters. Equal parts charming and chilling, this mystery kept me guessing until the very end. I loved Deputy Sheriff Keane and his determination to catch a killer and protect the people closest to him. With its twists, turns, and surprises, I thoroughly enjoyed Murder Comes by Mail and am eager to continue this entertaining series in Book 3, Murder Is No Accident! 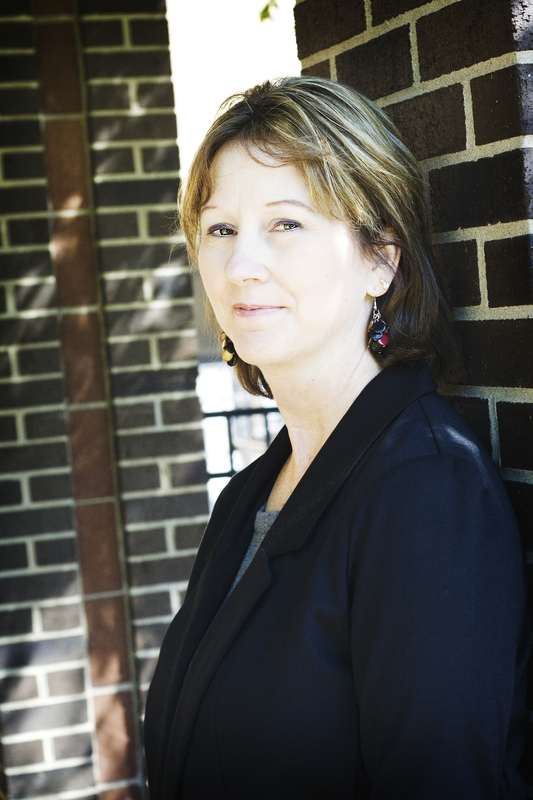 A. H. Gabhart is Ann H. Gabhart, bestselling author of many novels, including Angel Sister, Small Town Girl, and Love Comes Home, several popular Shaker novels such as The Outsider, The Believer, and The Innocent, and The Heart of Hollyhill series. Ann grew up in a small rural town in Kentucky much like Hidden Springs, but Ann is happy to report nobody was ever murdered on her hometown’s courthouse steps. Ann and her husband still live on a farm near that same little town in Kentucky. 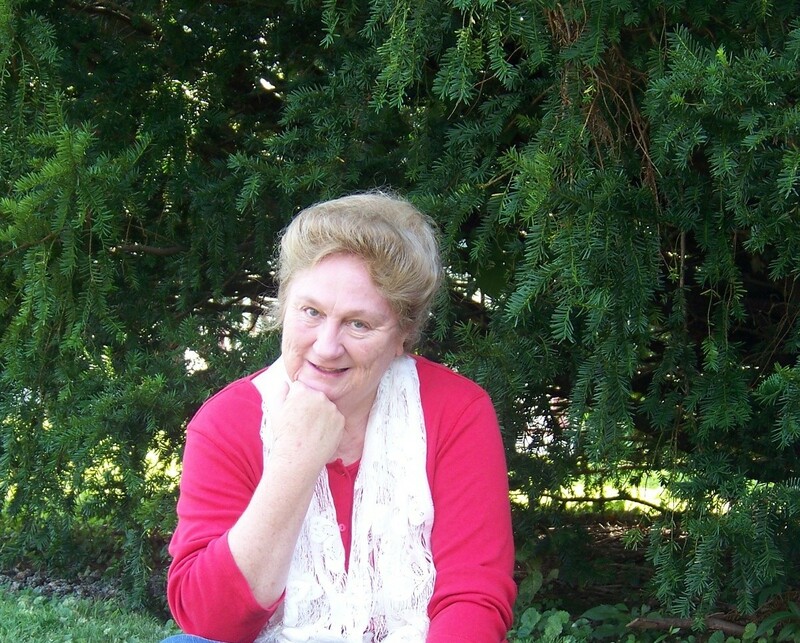 To learn more about Ann and her books, please visit her website. 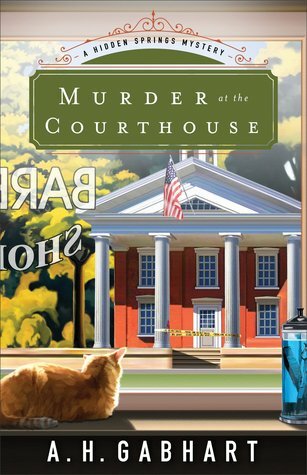 Murder at the Courthouse is an entertaining whodunit! 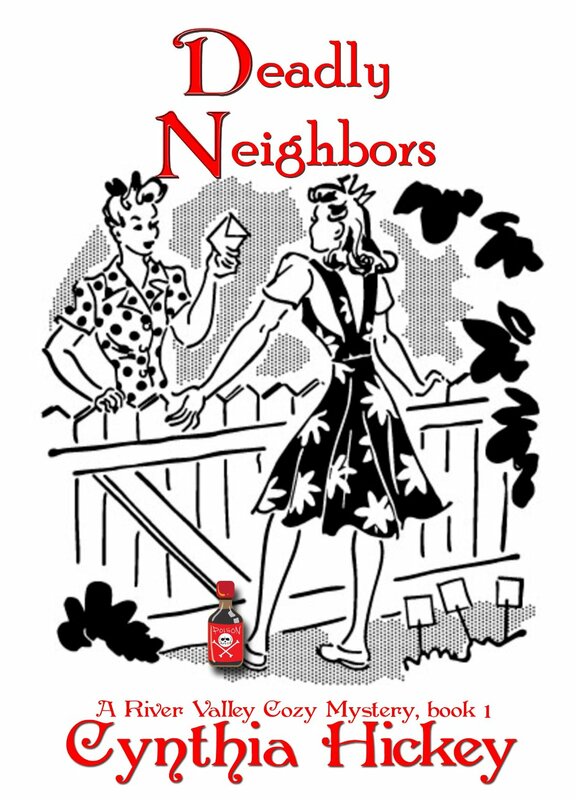 Ann Gabhart has a gift for capturing the essence of small town life, and she has certainly done so in this tantalizing tale. I was delighted by the colorful characters and the twists and turns of the story line. Although I had my suspicions about the culprit, Gabhart kept me guessing and didn’t confirm my thoughts until the very end. I’m excited about this talented author’s foray into the cozy mystery genre and look forward to continuing the Hidden Springs Mystery series! When Rosy McBride is left at the altar on her wedding day, she’s devastated. She heads back to her hometown of Galveston, thinking she’s going to collapse from sorrow. But her family has another plan: set her up with an old friend, Larson. 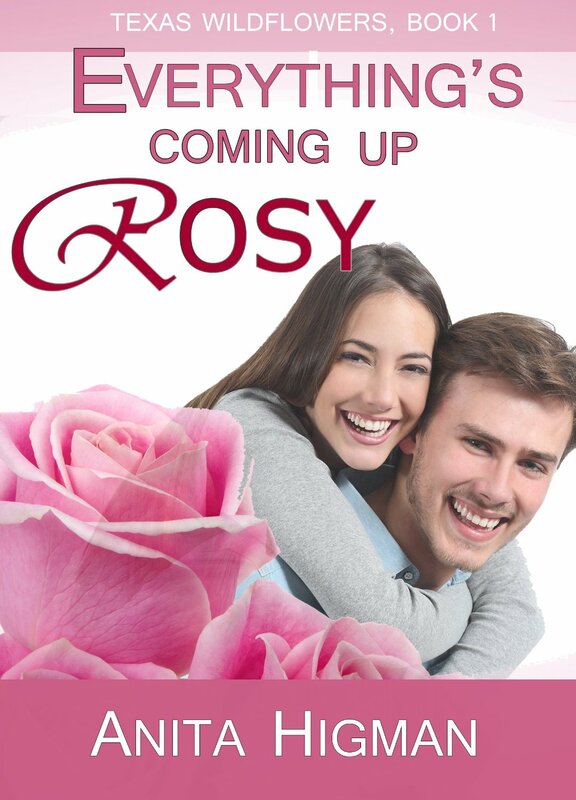 As he reveals his feelings, Rosy pulls back, but he is determined to help her find her way again—in love, in life, and in all that matters most. Ava Kingsley and Seth Walker might be the most unlikely friends ever. The only thing these two polar opposites have in common is a knack for wordsmithing. Back in college, they were known for their written sparring in the campus newspaper’s popular “He Says/She Says” column. At their ten-year college reunion, they pick up right where they left off. Except this time their squabbling leads to a surprising turn: friendship and a year-long exchange of emails. So when Ava approaches a crossroads in her athletics department career in Minnesota, Seth is quick to offer the open apartment above the restaurant he’s been remodeling in Maple Valley, Iowa. Ava doesn’t know where her career will lead her next, but she’s starting to suspect she might see Seth as more than a pen pal. Which would be exciting…except for the fact that he only sees her as a friend. As Maple Valley grows on her, Ava wonders if there might be something here for her even though Seth is unavailable. And maybe, just maybe, after all the words the two of them have exchanged over the years, they’ll finally be able to say the three that matter most. Three Little Words is simply delightful and a wonderful introduction to the Walker family! I loved Seth Walker and Ava Kingsley. They are adorable characters and I really enjoyed their great chemistry and witty banter. I was reluctant for this e-only novella to end, and am eager to return to Maple Valley as the Walker Family Series continues! When Marsha Calloway’s daughter is accused of a crime she didn’t commit, Marsha is determined to find the real culprit. She enlists the help of her Cadillac driving mama, the man who ditched Marsha at her high-school graduation but kept her heart, and a bumbling police officer. Folks around River Valley are having things disappear while they are sleeping with their eyes open. Seems everyone has a dream and not enough funds. Someone is determined to kill for that dream. Will River Valley’s cast of colorful characters live to see another day? Can Marsha find out who the thief is before she becomes one of the sleep walkers? Vannetta Chapman has spun quite a yarn with her latest release, Murder Tightly Knit! I loved this delightful tale of mystery, friendship, and romance! Since reading Murder Simply Brewed, I have been eager to revisit the Amish Artisan Village. These books easily stand alone, but I encourage you to read them in order. In doing so, you will come to know these special characters and understand their stories. Once again, a murder occurs in the Village and suspicions and suspects abound. I eagerly turned the pages, trying to guess the identity of the murderer, but remained unsure of the culprit until the very end. 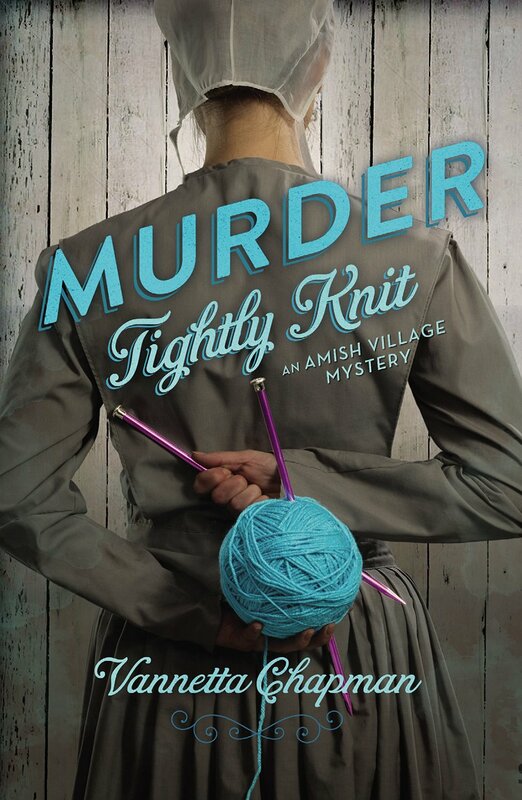 Murder Tightly Knit is a charming cozy mystery! I can’t wait to see what Vannetta cooks up in the next book in the series, Murder Freshly Baked! SALE! The e-book is only $2.99 until 01/12! V annetta Chapman writes Fiction Full of Grace. 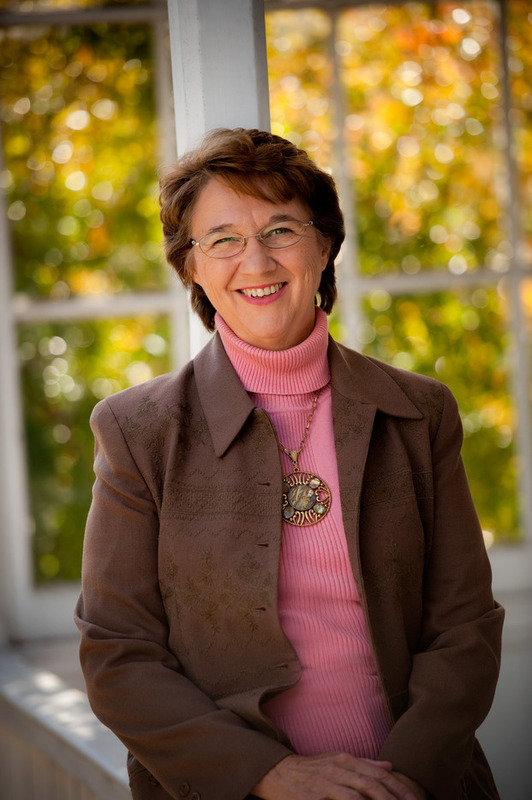 She has published over one hundred articles in Christian family magazines, receiving more than two dozen awards from Romance Writers of America chapter groups. She discovered her love for the Amish while researching her grandfather’s birthplace of Albion, Pennsylvania. Her first novel, A Simple Amish Christmas, quickly became a bestseller. Chapman lives in the Texas hill country with her husband. I received a complimentary copy of this book from the author. All thoughts expressed are my own and no monetary compensation was received. I love WWII era stories and was eager to read With Music in Their Hearts. Carole Brown did a great job of capturing the essence of the era. The colorful cast of characters entertained me, the story engaged me, and the mystery kept me guessing until the very end! I also enjoyed the glossary of WWII words and expressions that was included at the beginning of the book. Secret agents, spies, and murder…oh my! 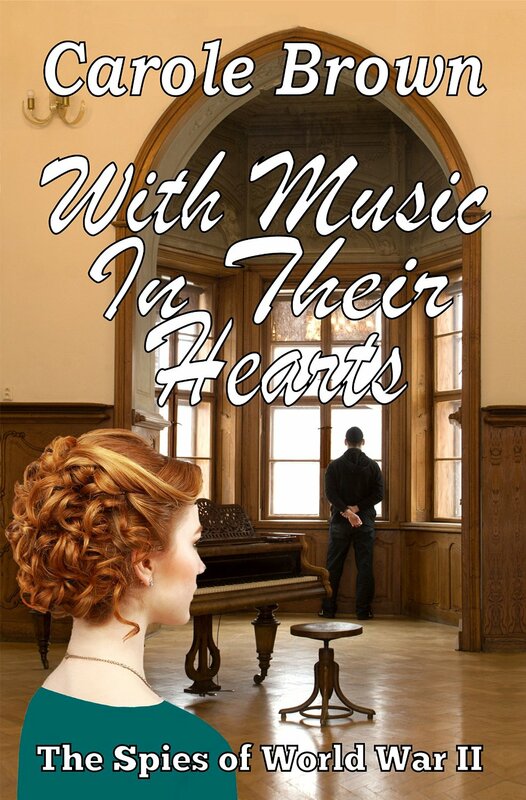 With Music in Their Hearts is a clever story, one I enjoyed and recommend for fans of cozy mysteries and historical fiction! Please give a warm welcome to Carole Brown! I hear you brought some guests with you today, Carole. Sounds like fun. Before you introduce them, can you tell us why you included so many characters in your novel? That’s an easy one to explain. With Music in Their Hearts is a spy/mystery/suspense. One of the main protagonists is a minister who is asked to secretly serve as a civilian spy because someone from a boarding house (run by the oldest daughter of a prominent Cincinnati citizen) is working as a foreign spy trying to obtain the new ammunition plans being developed at a local plant. To develop the plot, to include plenty of clues, and to increase the suspense I needed many suspects and what better ones than the inhabitants of the boarding house? They made for colorful and crazy secondary characters who added energy to Emma Jaine and Tyrell’s story. I hear you have some particular favorites here. Tell us . . .
Of course. Tyrell’s cousin and best friend–I dragged him from his duties as a FBI agent. It really wasn’t that hard: Ben Hardy loves the limelight and has that personable personality that draws attention. Lovely! Ben, why did you draw Tyrell into the spy business? He really had no training as such. Ben (mock-shocked expression): What? I trained him while we grew up. Always knew I wanted to be an FBI agent so I studied and aimed for it. Tried to get Tyrell interested, but he had his heart set to follow our grandfather in ministry. But when we needed someone to secretly spy at Emma Jaine’s boarding house, what better person than the one I’d taught every trick I knew? I knew his capabilities and his talents and convinced my boss, we should set it up. Tyrell was disappointed for awhile not to be accepted in regular service, but he’s a good Tom and came through for us. May I call you Gertie? Did you know Emma Jaine and Tryell were interested in each other and suspect the end results of them falling for each other? Gertie (A sniff): Well, I had my doubts for awhile. That Emma Jaine is a smart cookie, but when it comes to love, she’s blind as they come. Feared she was stuck on sugar daddy Hamilton Blake for awhile. Fortunately that sizzled out. And that Tyrell. Sure he was bamboozled by the wolfess in the house–Bette Williams, in case you’re not smart enough to figure it out–but something or someone knocked some sense in him. Wish he had the same sense to realize what kind of voice his has. Back to you, Ben. Can you tell us a little about yourself? Ben: I thought you’d never ask. My family says I get my swell personality and good looks from my grandmother’s side. Don’t know about that, but do think I have a reasonable amount of smarts, my fair share of looks (do blame my grandmother for this carrot top! ), and a knack for getting out of any trouble that heads my way. Could say a lot more but see Gertie’s itching to say something. Gertie (another inelegant sniff): Ben. He’s a braggart, but I do like the young man. He’s full of nonsense, but there’s more to him than meets the eye. As for me, what’s to tell? Came from a wealthy family, married an idiot who fortunately for me, died early on, and spent a lot of years traveling. Finally decided to slow down and since the depression robbed me of quite a bit of my inheritance, I wanted a more secure, smaller scale of living. Heard by way of gossip about the Rayner Boarding House and secured a nice apartment there. One of the best decisions I’ve ever made. Do you think you’ll appear in Carole’s other novels concerning Josie or Claire Rayner? Gertie: Who knows who’ll she’ll include? I wouldn’t be surprised seeing as I’m one of the most colorful of her characters. Josie’s story takes place close to home too, so I may just make an occasional entrance, but then Josie’s novel is entirely different than Emma Jaine’s so you can never tell. Claire, well, she’s a spoiled but sweet child, and you’ll have to wait to see where her story takes her. Can’t see traveling all the way to . . . You thought I was going to give it away, didn’t you? One last question, Ben. Will Carole share YOUR story with us? Ben (laughs): If she wants a bestseller, she’d better. Seriously, I’ve heard rumors that she’s thinking about it, someday. But don’t tell her I told you. Thank you for sharing a great interview! A vehicle’s tires spinning gravel behind him warned him he’d not lost the black car. Slowing. Creeping. Engine purring. Only a few feet separated him from the car and making a sudden decision, he jogged around the corner and hugged the building trying to put distance between it. The car’s tires squealed as the car sped up. The driver took the corner, gravel crunching and spinning into the air. They must have spotted him for the driver braked, throwing the passenger forward. Tyrell flung himself at the car and grabbed for the door handle. Something tugged at his arm. And the handle tore from his grasp as the car accelerated. The seemingly belated, reverberating crack of a gun vibrated the air around him. The car spun around a far corner, and Tyrell reached up to rub his stinging arm. The sticky wetness drew his attention. Blood. He saw the tear in his coat sleeve, the minute traces of blood oozing. Why would they—whoever they were—want to shoot at him? It was a scratch, and they’d been close enough to kill him if they’d wanted to. They didn’t want to. What were they after? A scare tactic? To warn him away? From what? Perhaps all this was a coincidence, a figment of his active imagination. No sign of the car. Satisfied he was rid of them, he entered the hotel. At the reception desk, he filled out the necessary papers, climbed the stairs, and headed down the hallway. At the far end, a red-haired woman inserted a key into the lock. She glanced his way, her luxurious hat tilted at just the right angle to hide one side of her face. With a flip of her plaid skirt, she shoved open her door and disappeared inside. Tyrell hesitated at his own door, next to her’s, but inserted his key and entered. Inside, he switched on a light then as quickly flicked it off. He stepped to the window. And drew in a breath as if he’d been sucker-punched. Down below, across from the hotel, the streetlight reflected off a long, black Oldsmobile. Standing beside the car staring up at the hotel, stood Ben Hardy. His cousin and best friend. Brown not only has her award winning (RWA International Digital Awards finalist in Inspiration, Laurel Award finalist, Selah finalist; Genesis semi-finalist) debut novel, The Redemption of Caralynne Hayman, available for purchase now, but a companion book called West Virginia Scrapbook: From the Life of Caralynne Hayman, filled with tidbits of information about West Virginia, quotes, recipes from West Virginia and from Caralynne’s life, pictures and discussion questions for the novel. Once again, Vannetta Chapman has created a delicious blend of mystery, friendship, and romance! In addition to the great story, I also enjoyed the glossary of Amish terms and the map of the Amish Artisan Village that were included in the front of the book. While Vannetta’s imagery is vivid, this pictorial reference of the village is an added pleasure! I enjoyed this cozy mystery and am eager to discover what will happen next in the Amish Artisan Village! Vannetta Chapman writes Fiction Full of GRACE. 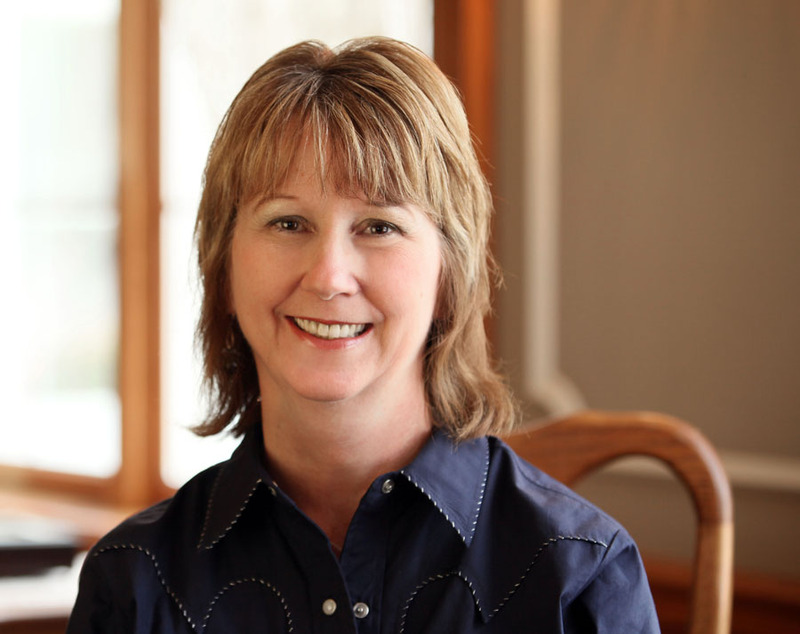 She has published over one hundred articles in Christian family magazines, receiving more than two dozen awards from Romance Writers of America chapter groups. She discovered her love for the Amish while researching her grandfather’s birthplace of Albion, Pennsylvania. Her first novel, A Simple Amish Christmas, quickly became a bestseller. Chapman lives in the Texas hill country with her husband. For more information, visit www.VannettaChapman.com. Please join me again Friday for a fun interview with Vannetta and a chance to win a copy of Murder Simply Brewed! * I received a complimentary copy of this book in exchange for an honest review, which I have given.